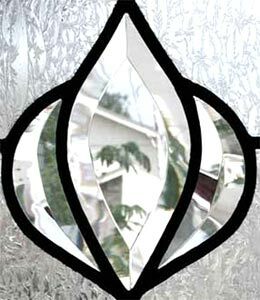 "C1V" LEADED GLASS SIDELIGHT WINDOW WITH BEVELED GLASS CUSTOM AT GLASS BY DESIGN. This leaded glass bevel C1V window was 12" x 36". The border glass was Flemish; the background was gluechip glass. The C1 "bevel set" is 4–7/8" x 6". There is no color in these glass. The camera sees everything through the glass.